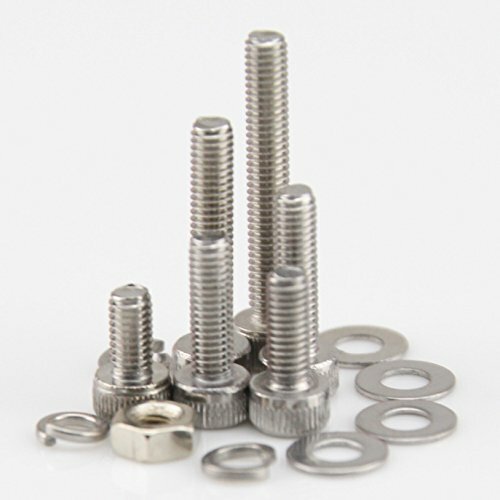 High Quality Stainless Steel Hex Socket Head Cap Screws Nuts Flat Washers Kit，nice rust and high tenacity quality. (high quality material) this product is made of high quality 304 stainless steel, strong and durable, antioxidation, corrosion resistance, high temperature resistance, high toughness and so on. (exquisite craftsmanship) high quality Seiko production, smooth surface, firm and strong, durable and wear-resistant, not rusty. With a beautiful and strong receiving box, it is very convenient to keep it. (function): This set of screws consists of a six angle screw and nut, a washer, and a humanized installation design. And distribution of six corner wrenches. Widely used in manual DIY production, robots, UAVs, aerial aircraft, 3D printing equipment, communication equipment, medical equipment, food machinery, petrochemical industry, marine power facilities, architecture and other fields.